My workshop produces no waste. When I make furniture I do my best to optimize the beneficial end use of the material that flows through my hands. I apply the same paradigm to wood scraps and shavings, and often derive as much pleasure from managing waste streams as from making functional objects. Deep Craft is all about stewardship of waste streams. The woods I use are from horticultural salvage; primarily native trees harvested from windfall, street trees and orchard groves including monterey cypress, claro walnut, acacia, madrone, elm and bay laurel, cut and air-dried by local sawyers. 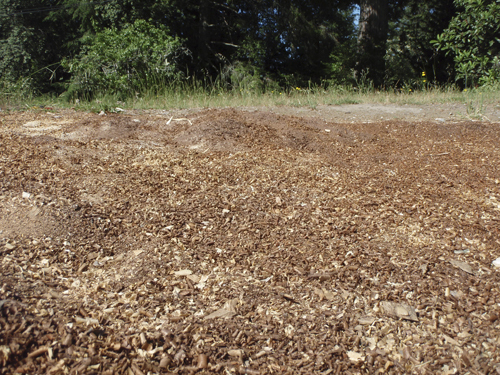 Dust and shavings from milling are composted, or used as fill if they contain toxins such as ‘juglone’ found in walnut. 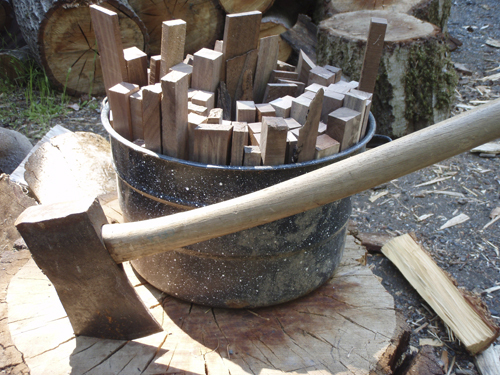 Small scraps become kindling for our woodstoves and fuel my wood-fired steambox for bending operations. Fruitwoods flavor foods cooked in our smoker or over the open coals of sweet embers. 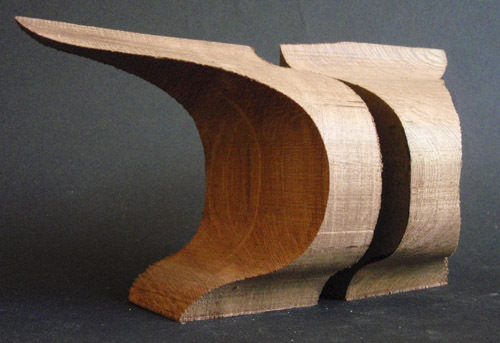 Larger scraps and oddly-shaped cut-offs (pictured at the top) often serve as inspiration for new ideas or find their way into models and fixtures for new projects. If I lack storage space, I give scraps away to friends and love to track how they are used. Sometimes my wood is returned to me in a new form as a gift, which I always find inspiring in unexpected ways. I hope to use this site to initiate a ‘scrap exchange’ along these lines, and will create an archive and database for the free exchange of ‘waste’ for products so realized. Some of these will be featured as GOODS for sale on these pages in the coming months. An important component of designing a new chair (the California Windsor) is how its manufacture integrates with the seasonal management of our property on several levels. I am beginning to study biodynamic farming techniques pioneered by Rudolf Steiner as a model for Deep Craft to serve as a potential extension of his agricultural insights. Posted by Scott on June 22nd, 2008, at 4:14 pm, and filed under all, california windsor, material lifecycle, studio process, waste streams.